All right, we’ve almost finished up our junk journal. So far we’ve chosen junk journal signatures, created a cover for our junk journal, and had a tutorial on junk journal binding. If you wanted to, you could absolutely stop here and have a very beautiful journal. I typically like to add a few more finishing touches to my book that make it a little extra special. So today’s tutorial is going to discuss how to attach a bookplate to your junk journal, how to create a junk journal closure and how to add metal book corners to your journal. These elements will allow you to slip a nameplate into the front of the journal which can add an extra element of personalization, keep your sometimes bursting journal closed and also reinforce your corners. There are dozens of different ways to create closures for your junk journal, from using an elastic band, to clipping a chain between each side to creating an eyelet closure. Today we’ll be doing the latter. It’s one of the easiest ways to make a sturdy closure for your junk journal, and one of my favorite. To make this you’ll want to have your eyelets ready as well as the tool to set them. I use a Crop-a-Dile because it makes my life a lot easier. Measure out where you want to place your eyelets and mark them. Then use the crop-a-dile to create the hole. Repeat on the other side. Then set your eyelets in place and use the crop-a-dile to pinch them down. Adding a bookplate to your journal is an incredibly easy way to add a bit of extra design. If you don’t have any on hand you can easily grab some on Amazon – just look for bookplates or metal labels and you’re like to find a good deal. 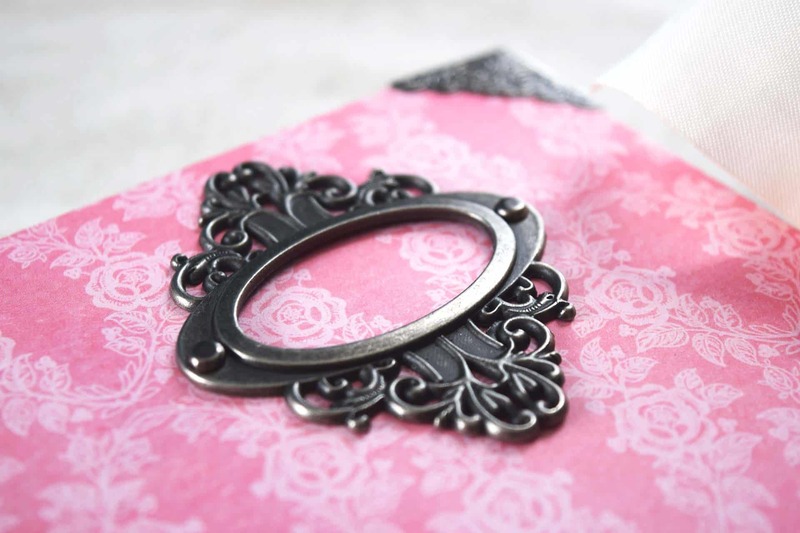 I found these guys that I’m thinking about trying, and then there are also my favorite tried and true Tim Holtz bookplates. My local craft store typically has them in stock, too. To get started you’ll want to find a good place on the cover for your book plate. If you have a pattern or other elements on your cover you’ll want to make sure that its placed in a way that’s not going to upset your design or look out of place. Otherwise you can just center it – use a ruler if need be! Then use a pencil to mark where the holes are for the brad. If you have a deep hole punch, you can use that to create the holes for your brads. If you don’t, you can just use your book awl to create the holes. Try to keep them as small as you can. Then place the bookplate over top and line it up with your holes. Insert your brads, flip the cover over and bend the tails back so it stays in place. If you don’t want the brad tails showing you can put this element on before you finished papering the inside of your journal, or you can put another piece of paper over top as a decorative element. I like to leave them exposed so that I can easily slip the book plate out if I want to change the card I put in it. I use all sorts of materials to cover my junk journals, including paper. The only downside to paper is that the corner edges can suffer wear and tear more easily than cloth. The best way to help reinforce them is to attach metal book corners. The corners will protect your edges and add an extra flourish to your junk journal, so you know, win-win! If you don’t have any on hand, there are tons of different styles on Amazon. Not surprisingly, my favorite is Tim Holtz, but there are plenty of others as well, like these or even these rose gold ones. I also recommend having some needle nose pliers handy and some fabric glue. (I didn’t have my pliers ready in the video though, and you can also just use a screw driver or other flat surface to help you get leverage). Start by putting the book corners in place. You can use 2 just on the front of the journal, or 4 to cover all your corners – its up to you. Get the process started by starting to bend them over. Don’t pinch them all the way shut yet, though. Before you do that you want to a dollop of glue on the inside. I use fabric glue and it works well, but there are also heavier duty glues made for metal if you want something that’s very heavy duty. Once you’ve got your dollop of glue on, replace the corners and then finishing clamping into place. Then let the book sit for at least an hour in order to let the book completely dry. Some glues dry faster than that of course, but I always like to be on the safe side. Another good tutorial. Thank you. What sort of plans do you have for covering the brads that now show on the inside? If its for personal use I usually put a little library card pocket there or some sort of pretty graphic. If I’m selling it, I often leave the brads uncovered so that the eventual owner can easily open it to put something(s) behind it, and allow them to put what they’d like over the brads.